Did you see our article in FabShop magazine this month? An article written by Steve Jones, architectural segment leader, and Mike Webb, field technical representative, on the rise of powder coatings in the architectural industry was recently highlighted in the May 2015 issue of Fabshop Magazine Direct. Click here to view the article. In the May/June 2015 issue of Powder Coated Tough Magazine, TCI included an ad highlighting architectural powder coatings, TruDurance and TruAnodize. Click here to view the ad. TCI is working to promote its coatings in industry publications in order to gain more exposure for our powder coatings. Want to co-market an application with us? Contact Kate Morger at KMorgner@tcipowder.com. Need Samples of RALs? Try TruPak! 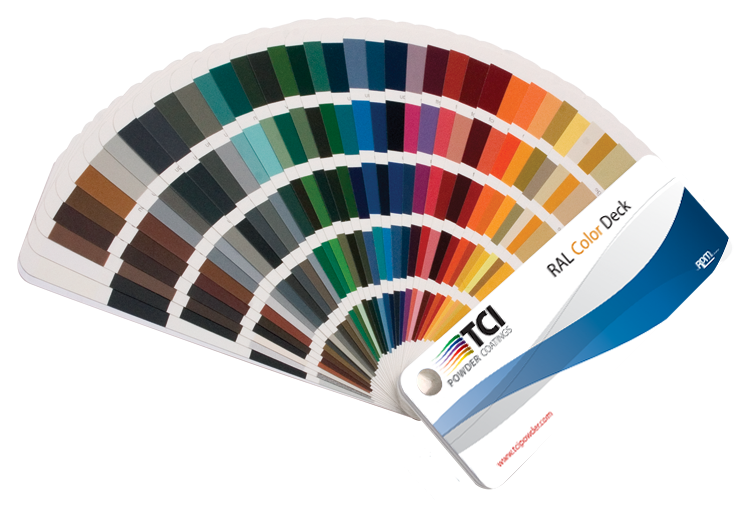 The RAL color matching system is the worldwide standard for powder coating colors. Our RAL powder coatings maintain all the original RAL standards while providing an enhanced appearance and increased durability. The TruPak program is ideal for sampling these products, therefore eliminating the guesswork for color and product. Order our high-quality powder paint in 1, 3, 5, and 10 pound boxesonline and choose from more than 300 of the most popular TCI colors which are available for immediate shipment. With TruPak, you no longer need to purchase large quantities of powder for your small jobs. TruPak is backed by TCI’s 24-hour technical service, which provides support on process and material issues. If you have any questions, contact us today to speak with a highly qualified technical representative. Need help figuring out which powder coating will work for your job? Want to see a color really quick? Check out our Color Selector on the website! We have made some recent improvements to this feature to make it even better. There is now a search box for if you know the product code or color name. Just put in your requirements using the easy dropdown menus and get the answers you are looking for. We also have added more colors including the multi-colors. You can even link straight to the products TDS next to each color. Of course, if you need help you can always reach your customer service or sales rep for more personalized product selection. We hope this feature will be of help to you and your business! All TCI product SDS’s have been updated on our website with GHS labels. Click here or visit sds.tcipowder.com to see the updated SDS’s. 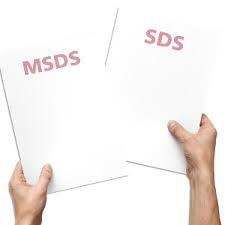 What's the difference between MSDS and SDS? Both MSDS's and SDS's are documents for hazardous substances that explain all the dangers associated with the material and information on handling, storage, and disposal. There were several formats of MSDS's, so OSHA's Hazard Communication Standard (HazCom) has been updated to globally standardize the content of all safety data sheets. June 1, 2015 was the deadline by which all US chemical manufacturers, distributors, and importers must reclassify chemicals and update all SDS's and labels to the new GHS (Globally Harmonized System) format. December 1, 2015: Deadline for distributors to eliminate inventory with old labels. Effectively, they can continue using the pre-GHS labeling system until December 1. June 1, 2016: The final deadline and date by which employers must be in full compliance with GHS. That means making any necessary updates to their hazard communication programs, training employees on new hazards identified during the reclassification process, updating workplace labels, and anything else required by HazCom 2012. Our customers are not impacted by the compliance with the regulation. The products have not changed, just how they are labeled. If you have questions please contact Mark Blalock mblalock@tcipowder.com or Chuck Pless cpless@tcipowder.com. Need an easy way to touch up uncoated areas or spots needing repair? After two years of development with Accurate Aerosol, TCI is proud to introduce TruTouch Aerosol Touch-up paints. TruTouch touch-up paint ensures quality and consistency with excellent coverage, adhesion flexibility, and exterior durability. Click here for more information on TruTouch Touch-up Paints. Contact us today to speak with our experienced team for more information on TruTouch Touch-Up Paint or any other powder coating needs. The decision between tribomatic and corona equipment is not always an easy one. To select the best system, consider the parts to be coated and the coating specifications, as well as understand the differences between the equipment, and the necessary technical criteria. 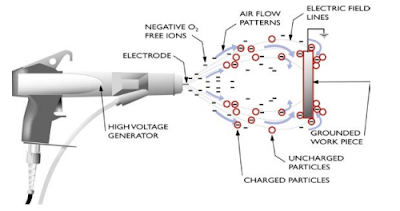 Tribomatic static charging is the second most common method of spraying powder coatings. In this method the powder develops a positive charge when passing through the spray gun walls. The positively charged powder particle is then transported to the grounded product by the air stream leaving the gun. Tribomatic charging is efficient in developing a static charge within the powder, however, coatings must be specifically formulated for this system. Corona charging is the most common method used in powder coating. This process disperses finely ground powder into an airstream, producing a cloud as it exits the gun. The powder particles pass through a highly charged and ionized corona field at the tip of the gun applying a strong negative charge to each particle. These particles then have a strong attraction to the grounded part and deposit there. This process can apply coatings between 0.8 and 10 mils in thickness and can be used for decorative and functional coatings. Most coatings with the exception of nylon can be applied using this process. Faraday areas can create application issues and present some difficulty coating deep recesses. Powder coatings are a high quality finish found on thousands of metal products found in everyday life. Powder coating provides a durable finish from industrial machinery to household items consumers use on a daily basis. Powder coated products provide great resistant to impact, chemicals, UV, moisture, and various climate conditions. Powder coatings provide a tough finish that is resistant to chipping, scratching, and fading. Our portfolio of powder coating products that are suitable for use on general metals is expansive and comprehensive. To facilitate the selection and implementation processes, we have developed a series of programs that support our customers and the successful completion of all projects. The Color Chip Program is designed to streamline the color matching process by collecting our 300+ most popular powder coating powders into a sample chip set, allowing you to easily share accurate sample colors with your customers. A wall-mounted display case is available to ensure your chip set is readily accessible whenever it’s needed. We implemented our TruXpress Rapid Response Small Batch Program to provide coaters with the fastest turnaround time in the industry. Through this program, we provide custom color matching for batches as small as 55 pounds. This service is available for all solid colors, super durables, AAMA 2603, 2604 and 2605 Colors, as well as most textures, wrinkles, peels and many metallic coatings. TCI Powder Coatings has expanded our services even further and has partnered with Intech Services to now offer more than 300 of our most popular colors in 1, 3, 5 and 10 pound containers. TruPak offers the highest quality, reliable powder coatings manufactured specifically for smaller packages. The TruPak colors come from our extensive product portfolio and are available in a variety of textures and effects that meet the quality demands you expect from TCI Powder Coatings.